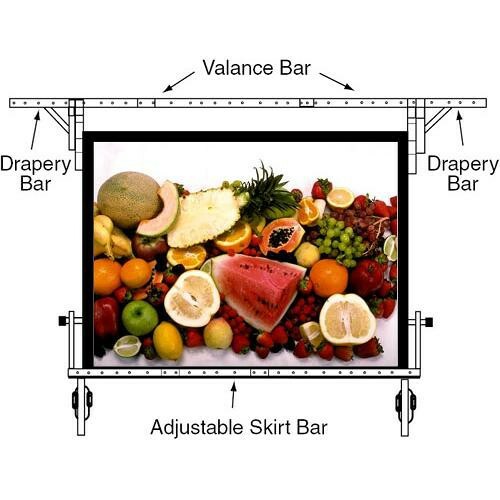 The Draper 56"x 80" UFS Euro Format Adjustable Skirt Bar is part of a complete Dress Kit. The bar holds up the bottom skirt and is made from durable aluminum. The value of the skirt is that it covers the base of the screen down to the floor and can hide any unsightly packing crates, cables or other material you wish to conceal. The bar is adjustable to accommodate the size and format of the screen you are using. It is adjustable in 6" (150mm) increments. In this way, you can tailor the appropriate Dress Skirt to the proper aspect ratio.